New Norfolk Under 7 Black playing Bagdad at Bagdad. 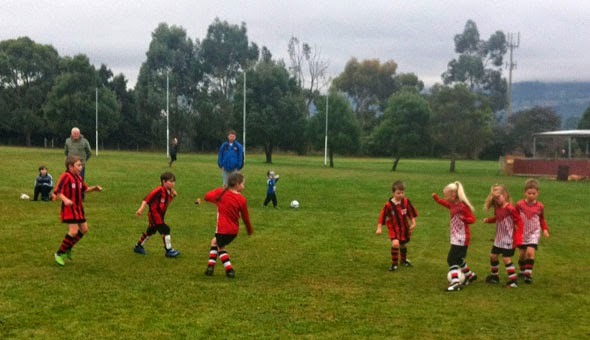 Under 6 Red played a great game against Glenorchy, showing great team work and great improvement from everyone despite being defeated. Well done Noah, Jake, Anna and Ruby. Under 6 Black played well and put in a good effort although being defeated by Holy Rosary. Good captaincy from Hemi. Well done boys. Under 7 Red travelled to Brighton for a game but unfortunately Brighton did not show up. Newcomer Joel will need to wait one more week for his debut match. Under 7 Black played Bagdad at Bagdad. It was a fantastic team effort with all players again showing great improvement. A standout was Tristan Nicholson scoring a great running goal. Well done to Amber Rainbird and Mikayla Bailey who both scored a goal each. Good luck for the next game on Friday night. Under 8 Red played Brighton under lights on Friday night. The boys showed they are coming together so well as a team with some great work and set plays resulting in goals. J’Khobi and Jack provided some great defence and Declan and Jacob Priest had some great saves in goals. 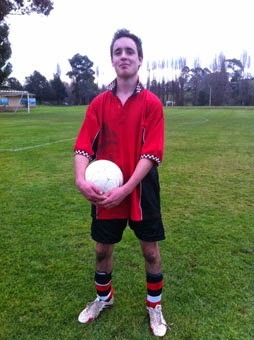 Nayte and Jack worked well in attack for a goal each and Jacob Priest kicked a lovely long range goal. Although undermanned, the team again showed great pirit. Under 8 Black played a great game against Dominic at Tynwald Park. Thanks to Jacob and Jack for playing for us, they both played a great game. Great teamwork by Mikayla, Astrid, Mia, Jacob Judges-Abel, Jess and great goal work by Joshua. Under 9 played a fantastic game regardless of the score. Well done to Caleb, Maiken and Caylin on their goals. Under 10 was defeated in a fast paced game by Glenorchy Knights. Goal scored by Jacob. Good work in goals by Alex McMillan and Alex Bourne. Great play by both sides. Under 11 defeated Brighton Gold at Tynwald Park. Goal scorers Brayden 2, Blake, Levi and Jed. Great job goalies Dylan and Josh. Well done all Under 11s on remaining undefeated. Under 16 came away with another win against Nelson. Billy was outstanding on the wing and Jayden headed a great corner kick by Liam for a goal. The team showed great skills on the field, pushing forward constantly. A fantastic effort. Seniors: New Norfolk Division 4 lost 5-1 at home against the second top team, Metro. An outstanding first half had the team only one goal behind 2-1. To start with Metro took the lead with a fine header and went two ahead following a wayward back pass, however the team rallied and dragged themselves back in the game with Ollie Chaplin firing an unstoppable shot past the hapless keeper. The second half started well for New Norfolk but they lost a third goal at the back post following a Metro corner. With nothing to lose New Norfolk threw caution to the wind and went on the attack. Despite creating chances to score they were unable to hit the back of the net and with space left at the back Metro scored twice more to kill off the game. This Sunday sees New Norfolk play another home game at 2.30, this time against DOSA. Come along and support your team.